You’re looking to purchase a new and inexpensive SUV, but there are dozens of options to choose from. We know that it can be challenging to determine which one of the affordable SUVs offers the best value for your money and which should be avoided for not offering as much quality and function for the price tag. To help you narrow down your list and set the “good buys” apart from the rest of the pack, here’s a list of the ten best new SUVs that you can buy for under $30,000. 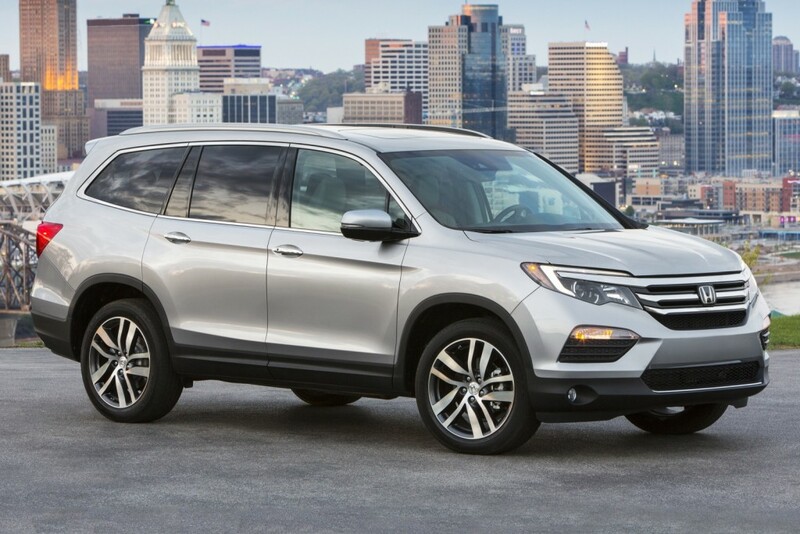 One of the best vehicles in Honda’s lineup, the Honda Pilot features comfortable seating for up to eight in a complete SUV package for just over $30,000. Lauded by reviewers as one of the best crossover SUVs available today, the 2016 Pilot hits all the right notes for an SUV with three rows of seating. Powered by a 280 hp 3.5L V-6, the Pilot is plenty fast for a crossover SUV. The transmission is based on trim, and most models will have this engine coupled with a 6-speed automatic. Honda’s AWD system works well over rough terrain, and despite its composed outward appearance, the Pilot can tackle moderately rough terrain. On paved surfaces the Pilot’s advanced suspension keeps the ride smooth and comfortable. The Pilot’s interior matches its exceptional road performance. Spacious seating, quality trim, and features abound even in the base models. The back seats are comfortable even for adults, and the Pilot’s quality and comfort will begin to rival much more expensive luxury SUVs when fully loaded. Honda’s attention to detail and commitment to delivering the best vehicles to its consumers is apparent in almost every aspect of the 2016 Honda Pilot. 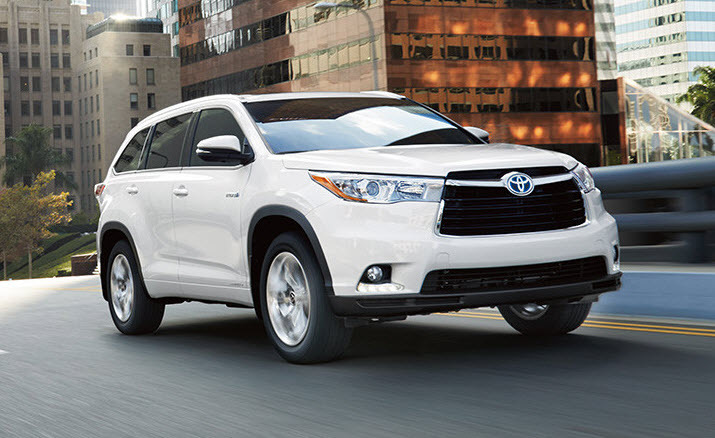 The 2016 Highlander is an exceptional eight passenger SUV made by Toyota. It may not be as rugged as its larger sibling, the 4Runner, but what it lacks in off-road performance it makes up for in comfort and versatility. Marketed as a crossover SUV for larger families or consumers looking for extra cargo room, the Highlander features spacious second row seating and an easily accessible third row. Under the hood the base model Highlander comes equipped with a 2.7L 4-cylinder coupled with a 6-speed automatic and front-wheel drive. Buyers can upgrade to a 270 hp 3.5L V-6, and that should be the preferred selection for larger families. The 4-cylinder performs adequately with a lighter load, but will begin to slog when the vehicle is full. The V-6 will be most welcome while towing, and all V-6 Highlander models come equipped with the towing package rated to haul up to 5,000 lbs. The interior cabin is quiet and roomy though as is common with most midsize SUVs, the third row lacks headroom and is best reserved for children. The seating in the first and second rows is very comfortable, and the Highlander’s interior feels overall very refined. Toyota has put together a solid SUV in the Highlander; one that is likely to resonate with buyers interested in the brand. 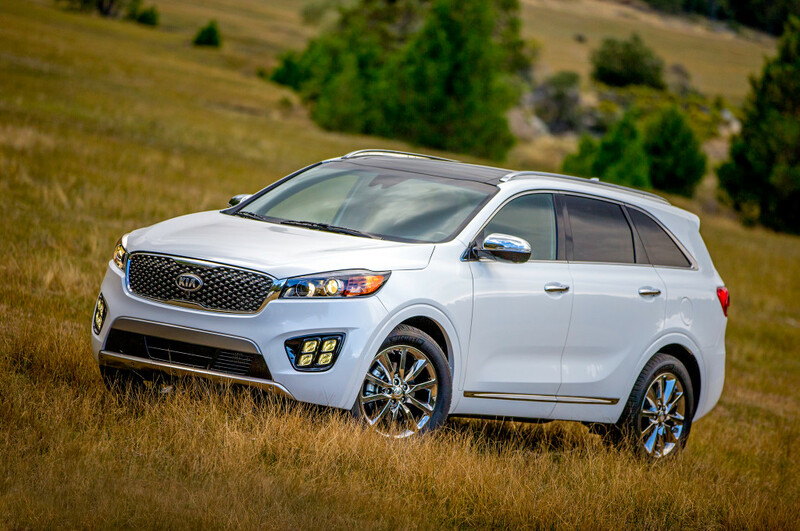 Significant changes were made to the 2016 Kia Sorento, and all of them have been good. Kia has added length, width, and height, tweaked the exterior styling, and replaced nearly every piece of interior for the 2016 model year. Now competing directly with other mid-size crossovers like the Highlander and Pilot, the Sorento’s upgrades and redesigns make it a tempting offering in that class. Behind the wheel, the Sorento’s changes become readily apparent with better handling, more natural steering, and a much smoother ride than last years model. The base model comes with the same 185hp 2.4L inline-4 that it did last year, but now Kia offers a perky 2.0L turbocharged 4-cylinder as an available powertrain. All engine options can be equipped with either front or all-wheel drive and are paired with 6-speed automatic transmissions. The entry model Sorento L is somewhat frugal with its amenities, but comes at a very low starting cost of only $25,100. More expensive trims reach closer to luxury comfort, but come with a price tag to match. The Sorento starts with seating for five, but a third row is available to add two more seats for its passengers. A slightly smaller and less expensive SUV, the 2016 Sorento is a solid SUV aimed at buyers looking for a different experience that still hits all the right notes for a commuter crossover SUV. 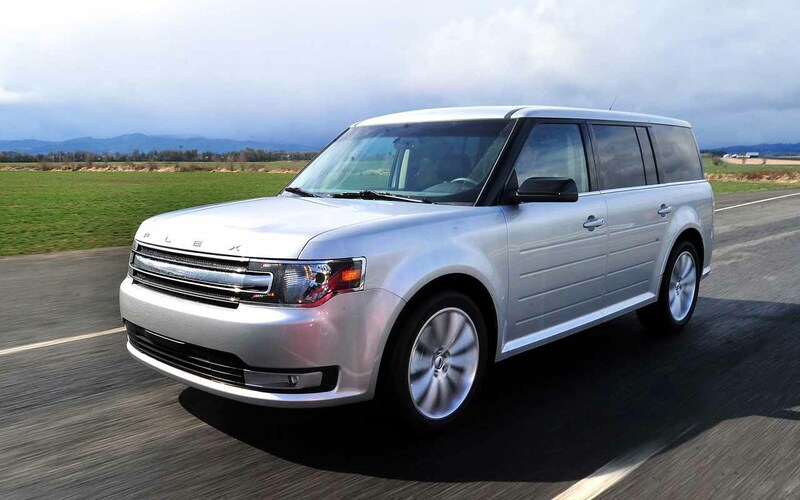 Mixing bold design with a strong understanding of the “utility” part of SUV, the 2016 Ford Flex is a total package for consumers who want their crossover SUV to tick all the required boxes. A radically different design sets the Flex apart from the rest of the pack, while great performance, handling, and interior space ensure its buyers won’t regret purchasing something a little different from the norm. Featuring a 3.5L V-6 as standard, the Ford Flex has more than enough power for everyday commuting, and a turbocharged V-6 is available for drivers who want even more zip in their rides. The Flex handles its seemingly large bulk with ease and is one of the best handling crossover SUVs on the market. Whether you love the Flex’s throwback looks or not, the design advantages are readily apparent as soon as you step into its cabin. It has one of the most spacious interiors of any mid-size crossover, and even the third row will comfortably fit adult passengers. The seat comfort has been much improved over previous years, and a rear-view camera is now standard. Ford has put a lot of effort into making an SUV that stands out from the “norm” in all the right ways. 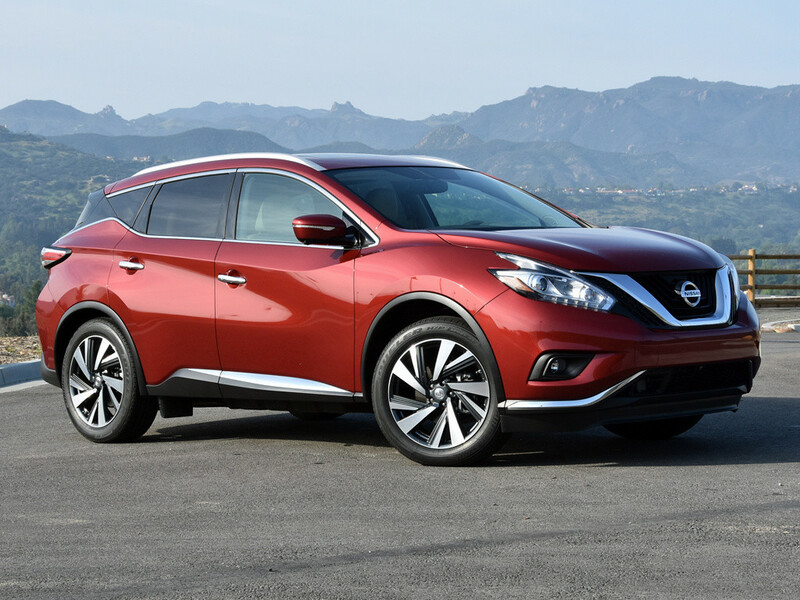 An IIHS Top Safety Pick and an attractive looking SUV, the Nissan Rogue aims to stand out with good looks and a third row seat that somehow fits into the Rogue’s small profile while still offering leg room for adults. The head room in the third row will fall short, however, and this makes it best reserved for children. The second row seating is adequately comfortable for adults and the Rogue offers a smooth ride for its passengers. The base model engine is a 170 hp 2.5L inline-4 and a CVT transmission. Power is average and the transmission suffers the same issues as most CVT transmissions, revving high at times when it shouldn’t. Seat comfort is good and the Rogue is relatively inexpensive, but no power seat is offered for the front passenger seat. The trade off is that it can fold down to add extra cargo space to an already large interior. A good looking SUV with some surprising utility, the Nissan Rogue gives a whole lot at an inexpensive entry price. The Pathfinder is the “big brother” to the above mentioned Nissan Rogue, fitting into the mid-size SUV class and exemplifying the requirements of that class. It’s bigger, more powerful, and offers more utility than the Rogue, with more cargo space, passenger seating, and features than its sibling. A standard 3.5L V-6 making 260 hp paired with a CVT transmission suffers the same flaws as the Rogue’s powertrain, but is much faster and more responsive. Driving in the pathfinder is easy and without drama; despite its bulk and size, the Pathfinder handles itself well with little roll and great steering response. The entry trim Pathfinder interior is very nice, particularly for its low price, but doesn’t offer many options or features in terms of aesthetics. There are plenty of safety and convenience upgrades to be had, and the seating is comfortable in the first and second rows. As is common with mid-size SUVs, the third row is best left for children or small adults. 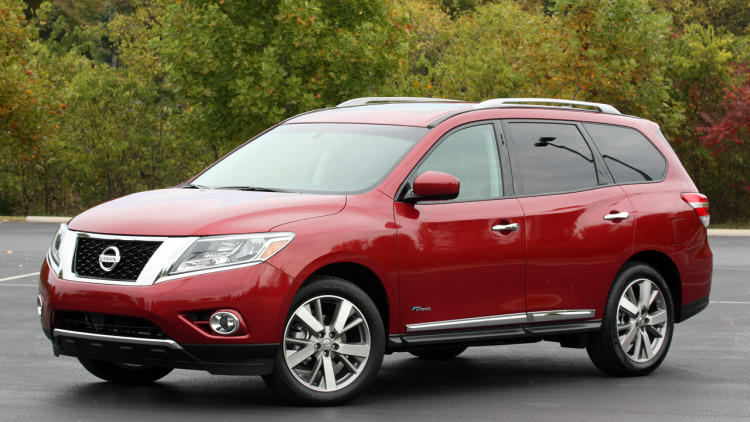 An all around smart pick for a family SUV, the Pathfinder fills its over populated class with sensible choices in the areas it needs to in order to excel. With a new focus on a great looking exterior and a tuned interior experience, the Hyundai Santa Fe becomes a competitive mid-size crossover for 2016. Its V-6 engine is average for the class and offered with FWD as standard. Hyundai has an available AWD system, but its largely relegated to helping in unpleasant weather conditions and has a significant impact on fuel economy. 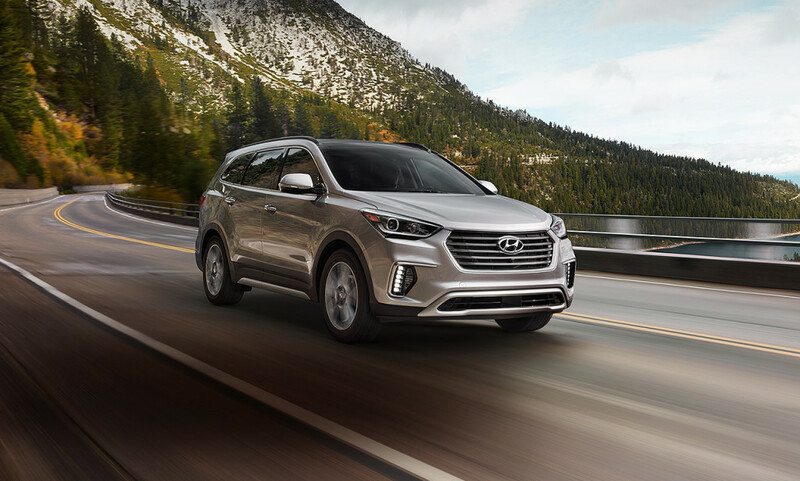 Passengers will feel very comfortable in the Santa Fe thanks to a relaxing drive experience and configurable seating. Either captains chairs or bench seats can be chosen, and both options present accommodating places to sit and relax with lots of leg room for adults. The third row does suffer as a trade off and is harder to access than other vehicles in its class. Once again, it’s best left for children. Hyundai has been working to present their vehicles as affordable commuter cars that still give their buyers comfort and quality. The Santa Fe highlights this new strategy in all the right ways. Mixing SUV and minivan seamlessly, the new Dodge Journey will strike a chord with buyers who are unable to pick between the two. Not only is the Journey inexpensive, a $20,995 entry price is one of the cheapest in its class, it’s big for its class and offers cavernous cargo and passenger space, just as one would expect from a traditional minivan. Except the Journey doesn’t quite fit into the minivan category, either. Its exterior styling clearly presents itself as a mix of the two, and it can be hard to tell where one ends and the other begins. The second row seating is fantastic for a vehicle this size, and the row doesn’t have to be reserved for the little ones in the family. Seat folding can turn the Journey into a serious cargo carrier, and the Journey’s ride quality is as good as any other vehicle offered by its competitors. The one downside to all of this value comes with the Journey’s engine and dated transmission. The base engine is a 2.4L 4-cylinder producing 177 hp. That’s not going to cut it when the Journey is fully loaded, and the engine is paired with a four-speed automatic transmission that doesn’t just sound old, it feels old too. 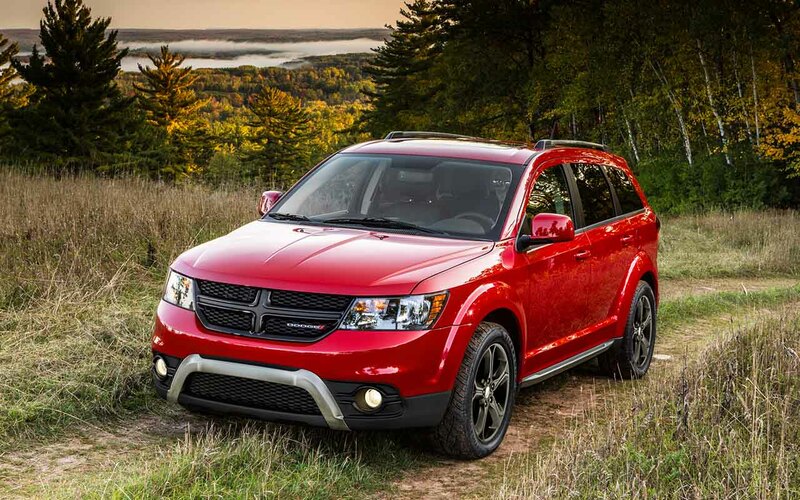 This isn’t likely to dissuade buyers looking at the Journey for the Minivan qualities it exemplifies, and the Dodge Journey may just be the best SUV at its price point available today. Honda has made all the right upgrades to its CR-V line for 2016, providing lots of space, a good driving experience, and plenty of utility all for well under $30,000. The first noteworthy change comes in its safety performance. In previous years the CR-V could be described as average at beast. 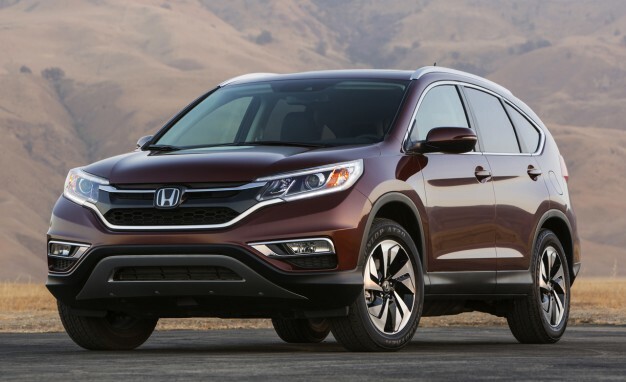 Not so for this year, as the IIHS has named the CR-V a Top Safety Pick+. Its 2.4L 4-cylinder paired to a CVT transmission gets decent fuel efficiency too, getting 33 mpg highway. The CR-V doesn’t feel quite as agile and responsive as a compact SUV could, trading ride quality and comfort over aggressive speed and handling. Given its purpose as a commuter SUV, that could be called a smart trade. Passengers will enjoy the comfortable seating in the CR-V, and drivers will appreciate its huge amount of cargo space and one of the best folding seat designs in any SUV. Combining Honda quality with smart utility and a commuter focused design, the CR-V holds up well under scrutiny and doesn’t compromise on quality, safety, or comfort. Toyota’s challenger to Honda’s CR-V is the new RAV4, a sporty compact SUV offering similar utility on a different design route. Where the CR-V’s focus is placed solely on driver and passenger comfort, the RAV4 shifts towards a more agile and responsive feel for its driver. The ride quality suffers a bit for this, and the seats can leave something to be desired for passengers in the second row. Toyota has placed a 2.5L inline-4 under the hood and offers the RAV4 in both FWD and AWD powertrains. It’s fast enough for daily driving but isn’t going to blow anyone away with straight line speed. Just like the CR-V, there’s plenty of cargo space in the RAV4, but the front seats in the base model were given less attention than they deserve, and the second row seating is below average at best. 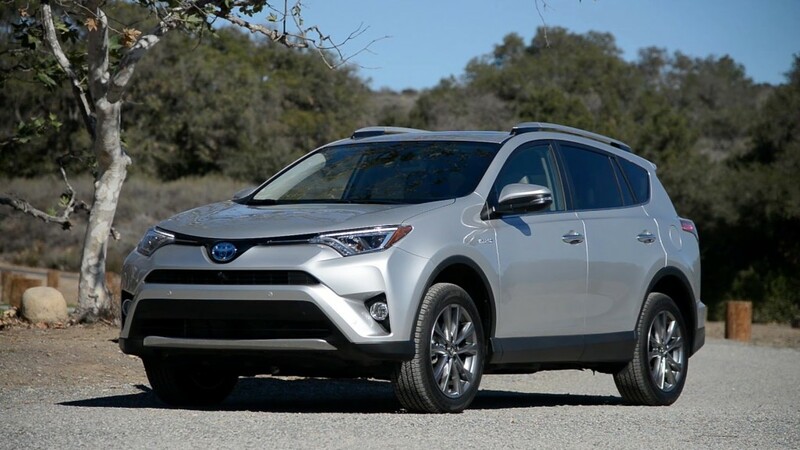 The RAV4 is a great compact SUV with Toyota reliability, offering a different choice for drivers who’d like a more controlled experience on the road without sacrificing utility. We’re interested to know – which of these SUVs are you most interested in and why? Let other readers know by leaving a comment below!